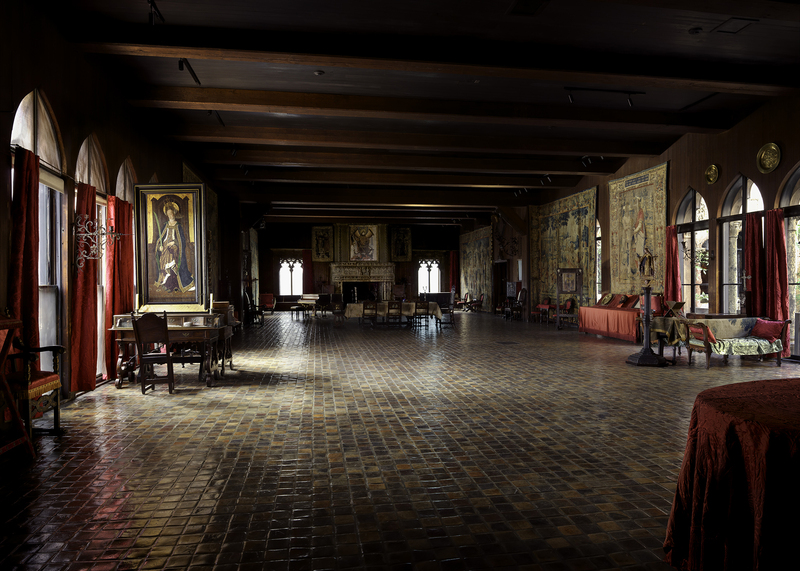 A grand and cavernous space, the Tapestry Room evokes a great hall in a northern European castle. More dimly lit than other spaces in the Museum and once used as a concert hall, the spotlight now shines on the works around its periphery, including imposing tapestries, furniture, architectural fragments at the doorways and windows, and several large paintings. The most arresting of these is Saint Michael, who stands over a massive fireplace from a French medieval chateaux. 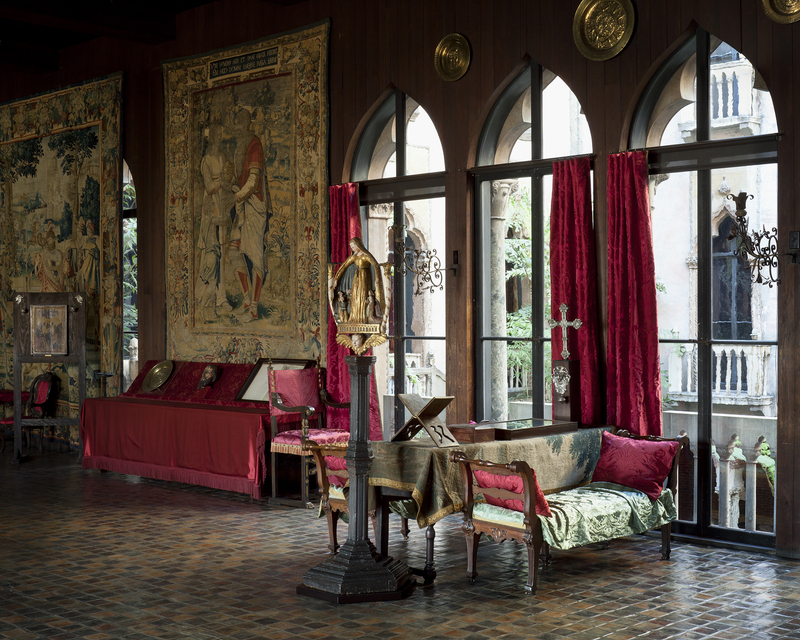 Ten large Flemish tapestries line the walls, enlivening this space with their rich textures and heroic exploits. Together they depict episodes from the lives of the ancient Persian king Cyrus the Great and the biblical patriarch Abraham. In 2011, for the first time since it opened in 1914, the Gardner Museum’s 4,000-square-foot Tapestry Room was restored to its original glory. The restoration of this beloved space returned the Tapestry Room to its original configuration for the first time since a temporary stage, chairs, and other modern elements were added to accommodate formal concerts in the early 1970s. 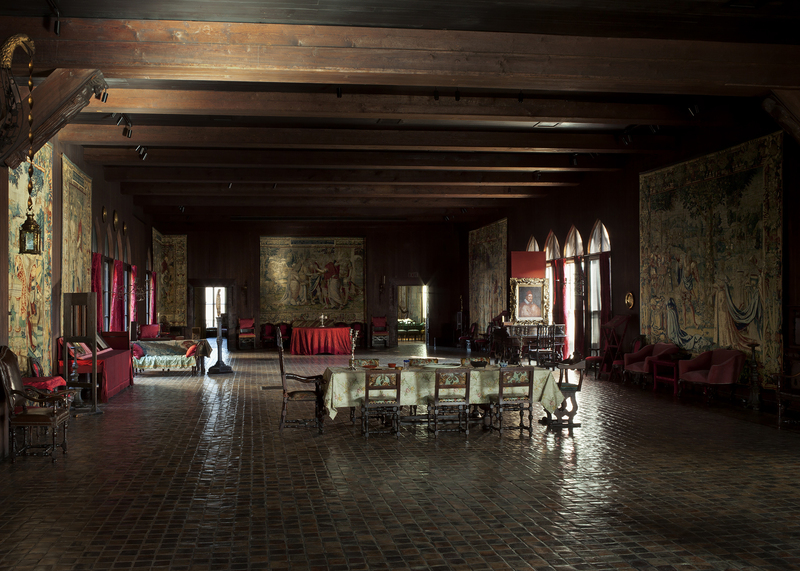 Historically, the Tapestry Room had been both a gallery and home to many of the Museum’s programs, including the popular Sunday Concert Series. Now, as part of the Gardner Museum’s Extension and Preservation Project, the Museum’s concerts were relocated to an intimate new performance hall in the Renzo Piano-designed New Wing, and the Gardner restored the space to its historic appearance, enabling visitors to see and enjoy the Tapestry Room for the first time in nearly 40 years. The gallery remained open so visitors could view the conservation and preservation work taking place. 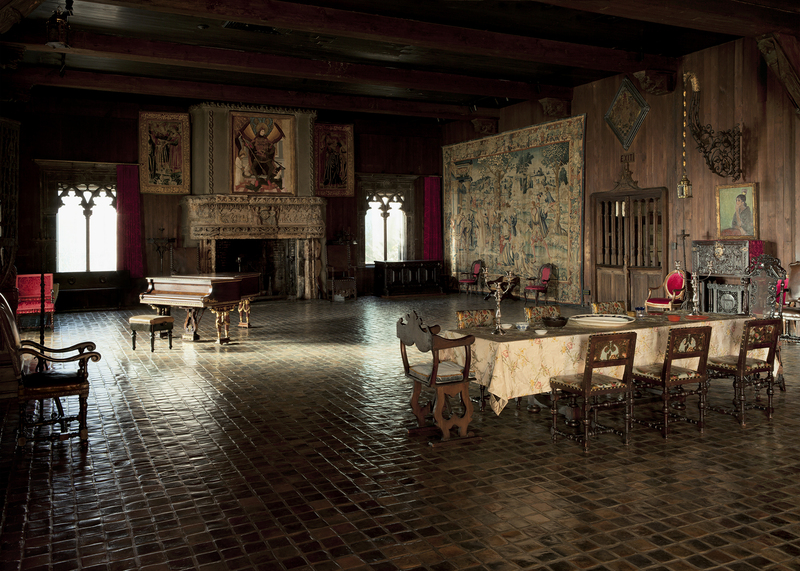 The reinstalled Tapestry Room was highlighted as part of the Museum’s grand opening for the New Wing in January 2012. Curatorial and conservation staffs planned the preservation and reinstallation of the Tapestry Room based on historic photographs from the Museum’s archives, which were taken between 1915 and 1926 by photographers T.E. Marr & Son. The photographs reveal a piano placed in front of the 14th-century French fireplace and an arrangement of furniture and objects in the center of the gallery. 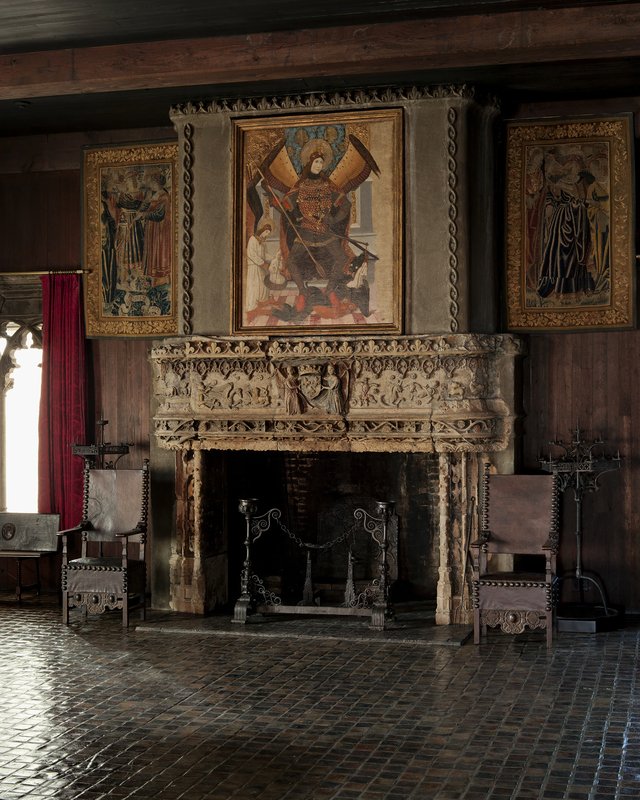 Conservation treatment encompassed cleaning, restoration, and reinstallation of many parts of the gallery—including its Mercer-tiled floors and French medieval stone fireplace, select art and furniture objects, and new lighting. The historic arrangement of furniture in the center of the gallery and other vignettes around the windows as depicted in early photographs were also restored. For visitors, perhaps two areas are most striking: the conservation of the massive fireplace and the painting of The Archangel Michael by Pedro García de Benabarre (ca. 1470) that hangs above it, and an arrangement of side chairs upholstered in 18th-century Netherlandish painted leather that were reinstalled around a 17th-century Dutch table in the center of the gallery. Additionally, lighting upgrades enhanced the gallery’s historic atmosphere, reduced harmful light on the collection, and improve visibility for the visitor. Eighteen textile projects were included in the room refurbishment plans. They include conserving original textiles, re-upholstering furniture, and replacing missing, damaged, or inappropriate furnishing textiles. Two tapestries were reinstated to their original 1926 positions. Watch a video on the cleaning and restoration of the tapestries.